Offering a cloud-based, configurable application that can accommodate multiple languages on multiple platforms, REDCap Cloud is the best system for commercial solutions of every kind, regardless of size or complexity. Set up and validate your study in a matter of days. REDCap Cloud offers simple, efficient workflows using our flexible workflow engine for easier data entry and management, and remote monitoring with minimal resource requirements. Get a single study subscription based on the length and type of study, from complex early phase studies that quickly collect data from a small number of patients, to more time-consuming late phase studies and sponsors looking to conduct multiple studies. Support complex studies that capture large amounts of data from multiple data sources with a business model for studies with short timeframes and a small number of patients. Data collected from Phase IIb & III studies form the basis for the labeling and approval of commercial products, and as such, must be of the highest quality. REDCap Cloud is a comprehensive eClinical solution that is capable of collecting, cleaning, and managing data and workflows from multiple sources and applications within a single platform. Find the best budget and timeframe, whether your research requires a short subscription model with unlimited users, a single study over a long period, or multi-platform global study. Design, deploy, and manage from a single system that captures everything at once. For Phase IV, registries, and outcome research studies that may be used to support labeling claims and reimbursement strategies, design the study once, deploy it to the right technology for the purpose intended, and manage the data and workflow from a single system with our multi-functional platform. Patient input is essential, whether to support clinical studies or help determine the effectiveness of a protocol, and with REDCap Cloud, no matter how the survey tool is accessed or what operating system is used for the mobile device, all the data sits in the same database. From single-arm, open label observational studies to complex, multi-armed, cross over oncology studies, we have the flexibility and experience to meet every study design for any therapeutic area. Accommodate research needs across your industry and around the globe with a system currently being used in over 100 countries. Choose REDCap Cloud for single language, single country, or global multilingual studies. A multi-functional platform that enables Sponsors, CROs, investigators, and research teams to collaborate around the world. 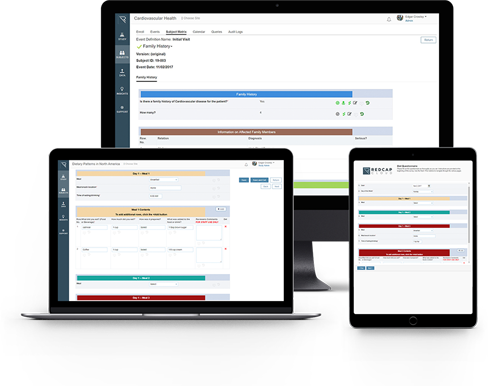 Our comprehensive on-demand, hosted eClinical platform integrates EDC, CDMS, eCOA, patient registries, surveys, and outcome tracking capabilities in a single solution. REDCap Cloud technology scales reliably and cost-effectively for research projects of all types and sizes including proof of concept, early phase studies, late phase studies, marketing support studies, surveys and questionnaires, patient registries, and outcomes research.